We caught up with SAI Florence Program Director Regan, who is contributing to our blog this month. 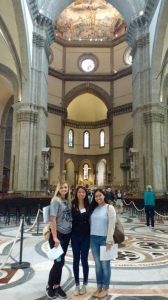 Regan is including her on-the-ground insight on volunteering while studying abroad in Florence. You arrive in a new country, new city, new culture, new school, new people … new everything! How do you get involved in your new community and enrich your already dense experience of studying abroad? For many students, volunteering provides a meaningful link to the community and a way of enriching the study abroad student experience. Get involved. Volunteering opens you up to great social opportunities. You meet people with similar interests and you try your best to share your passions by using your new language skills with locals. You are making contributions to a cause you care about and you’re becoming part of a close community of people who support each other. Melinda Church, Spring 2017, sells chocolate Easter eggs to help ATT raise money to support people living with cancer. Give back. Eliminating poverty? Assisting women and children in need? Finding a cure for cancer? Whatever your cause is, you’ll probably find a community of people who are already fighting for that cause. You’ll find support amongst each other and you’ll work towards making this world a better place. Gain experience. Not only do you gain a new perspective on issues facing your host country, you show future employers that you’ve developed soft skills beyond the typical study abroad experience, you are a team player, you have problem-solving skills and an awareness for community values. 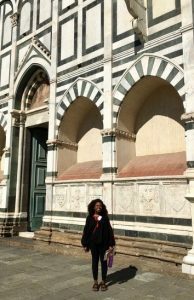 Alexandria Smith, Fall 2016, volunteers at Santa Maria Novella church, giving tours in English, for Ars e Fides. Volunteer Organizations. Your on-site staff can help you choose the volunteer experience that is right for you. 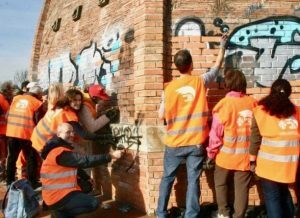 Whether you want to continue the community service projects you are engaged with in your home country or you are participating for the first time as a volunteer in your host country, there are many opportunities to get involved. Angeli della Città. Florence’s chapter of City Angels is dedicated to the protection of the weak and defenseless. Volunteers distribute food and clothing to those in need. La Ronda della Carità e della Solidarietà. 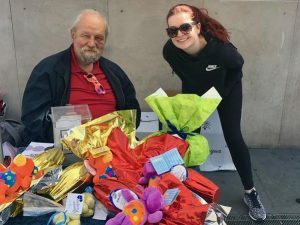 This volunteer organization distributes sandwiches, hot beverages, clothing and sometimes even furniture donated by volunteers to Florence’s poor, elderly and immigrant populations. Creative Corner. Creative Corner is an association that aims to provide adults and children with access to courses in the English language, dance, music and the arts. Angeli del Bello.The Angeli del Bello is a program that encourages citizens to ‘adopt’ a part of the city that they will then care for and keep clean. UNICEF. This organization is active all over the world working to safeguard the rights of children. They seek to protect and advance healthcare, education and protection for children. Volunteers help with fundraising activities. Associazione Tumori Toscana. This association operates not only in Florence but in nearby Tuscan cities, such as Prato and Siena, offering free home care to cancer patients 24 hours a day, every day of the year. 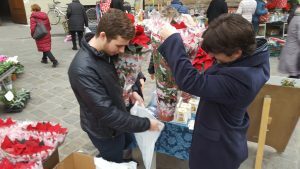 Volunteers help with fund-raising activities. Ars et Fides Firenze. This association provides volunteers the opportunity to give free guided tours, in English, in one of the many historic churches in Florence. Misericordia di Firenze. Volunteer to give guided tours, in English, to visitors of the Misericordia Museum with displays 700 years of the charitable institution’s history, charting the course of the Misericordia’s past role during plague and cholera epidemics and its services today. La TInaia, Center for Expressive Activities. This association provides a space for creative activities for people with physical or mental disabilities. St. James Episcopal Church. Founded in 1850, St. James provides a place of workshop and community for English-speaking people with a multilingual international congregation. Volunteer in the library reading English language books to children. Canadian Island. A kindergarten, day camp and summer camp, offering lessons in English and Italian. Volunteer your language skills to help in the classroom. The SAI Florence office welcomes students to study abroad with SAI at Florence University of the Arts (FUA), Apicius International School of Hospitality (AISH), and Polimoda Institute. Programs are available in the semester, summer, and intersession, as well as at the professional master level.